If the kitchen is the most functional area in your home, it is the bathrooms which are ideal for relaxing. But modern homes have space limitations. And this space crunch really limits your possibilities for designing your bathroom. But does it? 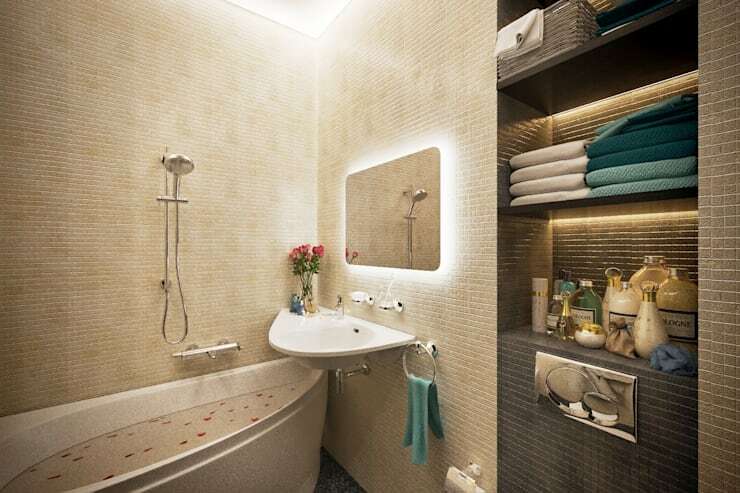 It may seem a difficult task to design a small bathroom. These spaces can pose a clever design challenge because you need a storage-friendly and functional bathroom without compromising on the design element. So, before you take up this task, choose your tools carefully. In other words, think of each design element and how it can contribute to the overall purpose of the bathroom. Also, it is good to remember that you cannot alter the existing space. You need to work with the space that you have. Before you take a plunge, think of the blueprint; save your space dilemmas with some smart and simple bathroom solutions. With every remodelling assignment or every renovation task, you need to have a budget. And often money becomes a constraint. You can solve this as well, by looking into some smart ideas which are pocket-friendly and make your bathroom look beautiful. Simple things like a mirrored cabinet or a hidden cabinet instead of a vanity can save your space problem. Another trick which really works for your bathroom woes is a mirrored wall. 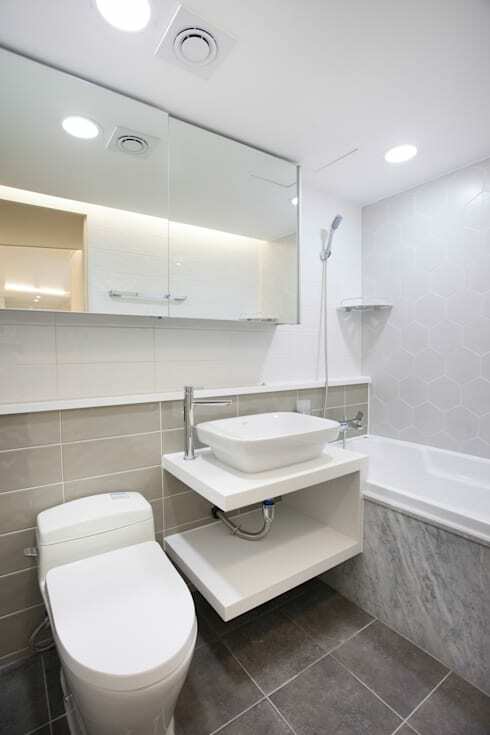 This creates an illusion of space, and your small bathroom will no longer look small. There are homemakers who are opting for wall-hung toilets, where the tank part in recessed inside the wall, saving precious space. Plus, this looks very neat and tidy. 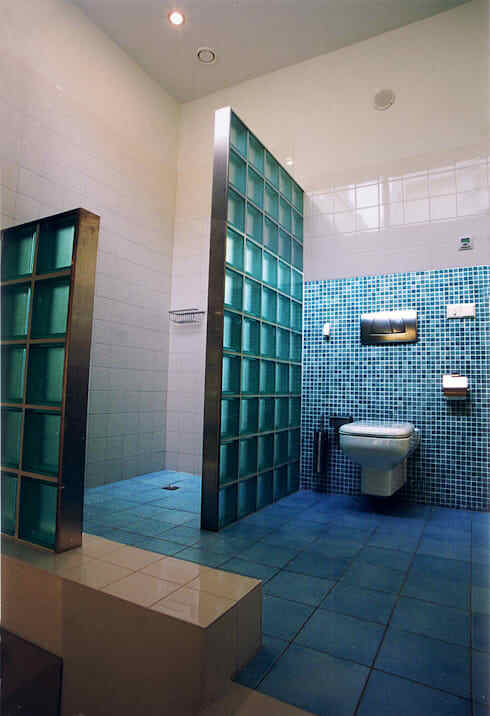 If you have no space for shower cubicles, you can easily opt for a frameless glass door. The gain is more on the visual lines, and as the shower disappears you will suddenly notice a lot of space opening up. You can have a mix of shelves and cabinets in your bathroom. Instead of going for large furniture pieces which will make the room congested, you can incorporate open shelving for towels. Take a look at the lovely floating shelves which are flexible and at the same time fashionable. If you have chosen a sober colour scheme for your bathroom, adding colourful towels can create a happy mood. Check out the new storage ladders which are great for storing different types of containers. A combination of different storage systems creates a playful mood in the bathroom. Experiment with sink skirts. 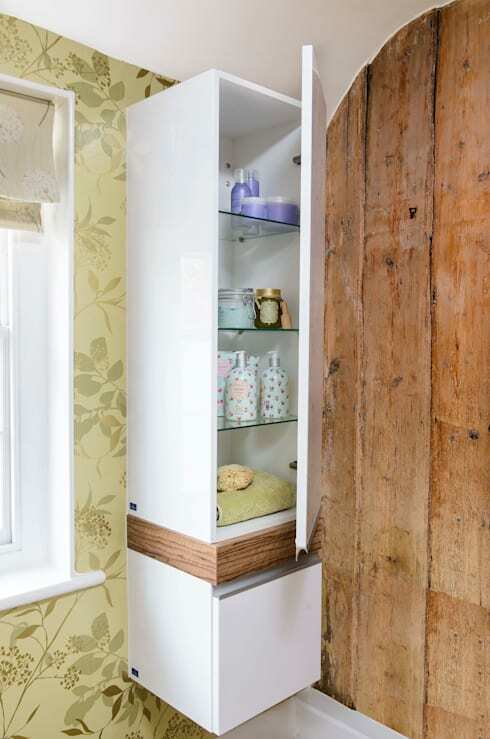 Adding the skirts can create a space for your cleaning products which otherwise becomes a headache. If you do not have enough disposable walls, you can opt for stacking your stuff in wooden crates and place them on the ground. And if you want to drill them in the walls, you can create an asymmetrical line without creating a clutter. Take a close look at the compact wall rack that UK-based interior architects Workshop Interiors has created. How your room looks depend largely on what colour you choose. 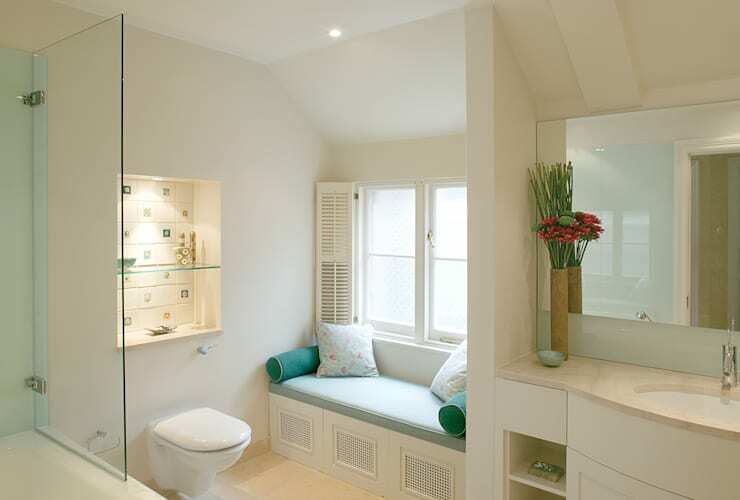 For bathrooms, choose soothing pastel shades which will make you relaxed. Whenever you think of the main colour scheme, you should go for shades which are visually calming and aesthetically pleasing at the same time. After you have chosen the base colour, you can opt for different patterns and textures so that it adds depth and layers. One can experiment in various ways with shades of white. Plus, it looks clean and tidy. Open up your imagination and think how you can create a balance of colours. If white is your base theme, you can choose to add pops of colour in accessories and cabinets. Place colourful stylish soap dishes by the sink or choose something vibrant for the mirror frame. Bright-coloured towels can cut through the monotony of a white base. And visually it is extremely enticing. A wall-to-wall mirrored cabinet is the simplest way to create a visual illusion of space in a small bathroom. And when you come to think of the storage space you are going to have, you are bound to be impressed. Also, bathrooms are known to be places where you indulge in a little me-time. Just think of a typical morning when you look at the lovely mirror and smile at yourself. Mirrors can also be cleverly used as walls. It is one of the oldest tricks in the book which make small bathrooms look spacious. Adding mirrors to the bathroom can be quite beneficial in different ways. Mirrors increase the light inside the room and give an open feel to the room. If you do not have space to fit in shelves and cabinets, you can keep the decor of the room floating. To diminish visual clutter, and give a free feel to the bathroom, you can install racks and bars. Both of them are extremely functional and can be used for hanging your robes and towels. Bars can be easily installed at the back of the bathroom door cleverly concealing it from your guest’s view. If there is not enough room for hooks, you can opt for a specially designed towel rack which can be attached to the hinge of the door. These have 18-inch long hooks which pivot independently which mean that there are lesser chances to cause damage to your doors. And if you really want to experiment with the look of the room, you can be at your innovative best. How about adding a wine rack to the bathroom? You can use it to store your rolled towels. The towels fit perfectly in the curved holders. And come to think of the design, it is truly different! To increase the storage space, you can opt for multi-functional racks which have shelves above them. Some of them also include hooks to hang your robes. Think of this item; one useful rack will serve the purpose of three. 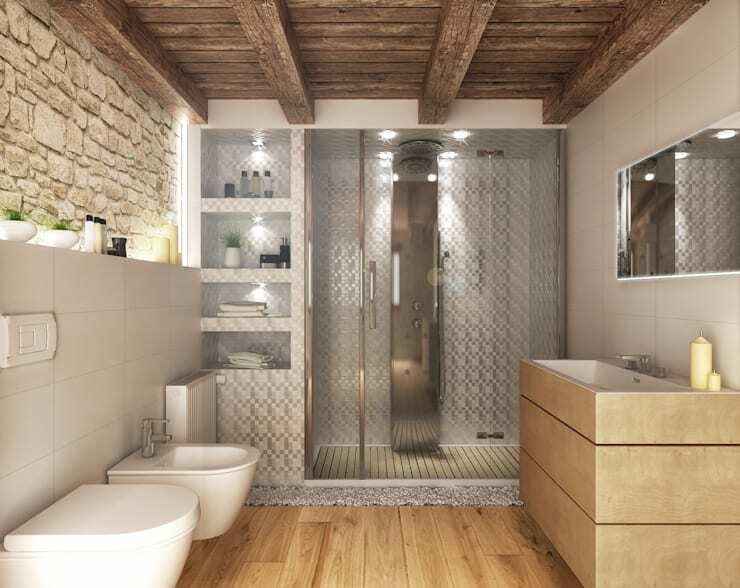 You can enhance the utility of a small bathroom by including a walk-in shower. The shower will seem a natural extension of your bathroom. If you have space, a knee wall with a mirrored door and shallow vanity will look amazing. But a frameless shower with no curbs will look equally ravishing, especially if you a mirrored wall. The reflective surface allows light to move around this space creating a roomier bathroom. And if you think of the visual appeal, it looks absolutely stunning! How about installing a shower curtain instead of a glass door? This is a much better option that a glass door which can take space to open and close. And to make it extra useful, you can also choose a shower curtain with pockets for storage. This will be useful to store your soaps, sponge and shampoos. To enhance its visual appeal team it up with a dual shower curtain rod. Now, you can hide the shower curtain with pockets effectively and keep up with the lovely decor of the bathroom. Instead of clearly demarcating between the shower area and the rest of the bathroom, make your bathroom one big happy place by using the same tiles. Never use dark walls and light tiles in the same bathroom, because it will create a visual impair making the bathroom look small. If you blend the wall colour and the shades of the tile, it will double the space in your bathroom. Always remember that if you are pairing up a darker and a lighter shade, it would cut the space of the toilet visually. Using similar shades helps to diminish the planes, transitions and the intersections within the bathroom creating a unified expansive view. Now that you have all the tricks, it is time to start your remodelling venture. Take out some time of your busy schedule and start planning the changes. It will be a fun activity because as you experiment with the decor, you come up with new ideas and bright solutions. Even the simplest of changes can make a lot of difference to the way your bathroom looks!